These tear away molds are useful for most epoxy and acrylic resin embedding media and for paraffin waxes. Especially suited for use with paraffin. These molds may be used under anaerobic conditions. Peel-A-Way® I.D. Tabs are for use as identification with the Peel-A-Way® embedding molds (8000 per book). 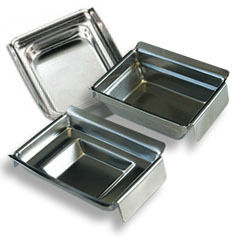 High quality, yet economically priced stainless steel base molds for use with all standard tissue and biopsy cassettes. The reusable molds are 5mm deep and have extended legs for improved stability. Smooth stainless steel surface and rounded corners to facilitate easy removal. Flat base for maximum thermal transfer. Available in 5 sizes. Sold in packs of 12. Fully comparable to more expensive brands - great savings - high quality. Archimedes™ Pearlex (Ceramic) coated stainless steel, base molds provides a new standard of non-stick base molds for use with all standard tissue and biopsy cassettes. The reusable molds are 5mm deep and have extended legs for improved stability. 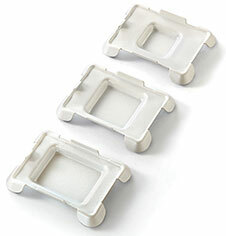 The Pearlex surface and rounded corners provide for effortless block removal from the base mold. The Pearlex coating provides exceptional thermal transfer. Available in 5 sizes. Sold in box of 12. 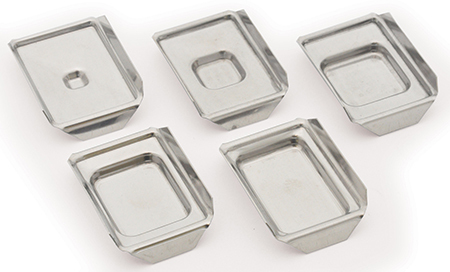 High quality, economically priced stainless steel base molds for use with all standard tissue and biopsy cassettes. Flat base for maximum thermal transfer. Available in 7 sizes. Sold in packs of 5. Two unique sizes of molds designed for embedding needle core biopsies, #27276-2 and 27276-3. The last two molds in this series, #27276-6 and 27276-7, have a depth of 9mm to accommodate larger tissue specimens. For use with tissue and biopsy cassettes. 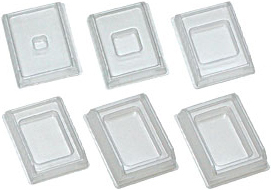 Five millimeter deep molds are made of stainless steel and are reusable with extended fins to prevent tipping and provide gripping surface for easy handling. Flat metal bottom allows maximum thermal transfer. Can also be used with the Processing/Embedding Cassette Systems. Reusable. Stainless Steel. Embedding rings will fit all sizes. Available in 6mm (1/4) and 12mm (1/2) depth. 12 molds per case. These molds are suited for all applications in specimen embedding with the 27198, and 22100 Series Super Mega Cassettes. Manufactured from high quality stainless steel for optimal thermal transfer, the mold has a highly polished surface for easy paraffin block removal. Reusable. Stackable for easy storage. 27197-1, 27197-2 and 27197-4 have higher sides than competitor super mega base molds. The higher sides allow for more paraffin to be used during embedding assuring a stronger bond of the paraffin block to the cassette. Use HISTOBOND® + Super Mega Slides and Coverslips for large sections. Excellent for use as a base mold coating to allow for easy separation of paraffin from the base mold. Helps to prevent paraffin build-up on metal base molds. A mold release concentrate used to coat base molds for easy release of paraffin blocks. Dilute 5ml of concentrate with 95ml of ethyl or isopropyl alcohol. 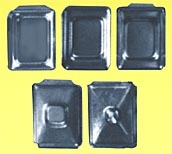 Dip molds and dry before use. 4 oz. bottle. For use in chilling and preparing paraffin blocks for sectioning and as cold tray for other laboratory procedures. Polystyrene top and base are molded together for tight seal. Freezes in approximately 4 hours in conventional freezer. Surface remains cool for up to 3 hours. Six cold plates and one insulator base per package. 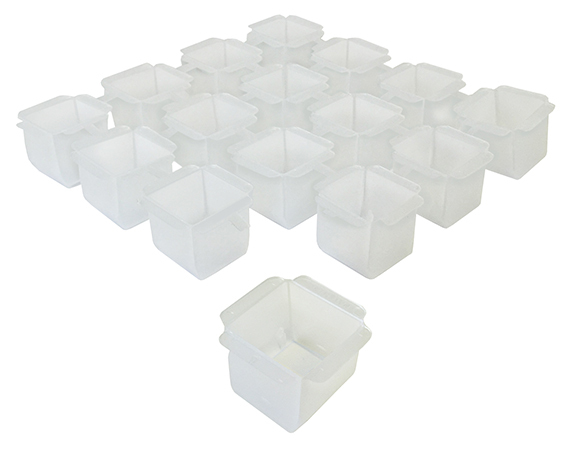 Disposable base molds offer ease and convenience of operation. They are inexpensive enough to be discarded after use, yet strong enough to be reused. Made of PVC, they offer excellent thermal exchange. They have a smooth interior finish and rounded corners to facilitate their removal. Also, they are available in the same variety of sizes as metal molds and can be used with the same styles or types of cassettes and embedding rings. Sold in boxes of 500 molds. Tissue-Tek Cryomold® creates a uniformly shaped, flat-surface specimen blocks with O.C.T. Compound for frozen sectioning. Disposable PVC plastic molds fit Cryobar® freezing wells. Available in 3 sizes: biopsy (10 x 10 x 5mm), intermediate (15 x 15 x 5mm) and standard (25 x 20 x 5mm) are provided 100 per package.